Tears to Tiara II is a story of historical fiction, where the last of the Barca family, Hamil, rallies his supporters to rebel against the Empire. The whole story is actually pretty interesting, and contains some obvious real-world influences (the game is set on the peninsula nation of Hispania... wonder what it's supposed to be). There's some religious themes, too, so it might bother some people, but again, no problem with me. Each character's dialogue artwork and the special CG scenes are really well done. Battle models are 3D chibi versions of the characters, which seem a strange contrast to the sometimes dark and bleak nature of the game. 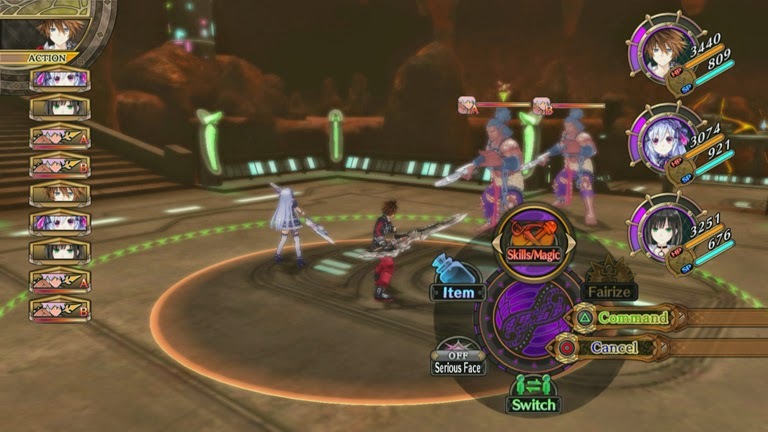 The game is billed as a hybrid of visual novel and strategy RPG. Story sections are obviously the visual novel half. There is a lot of dialogue, with nicely done character portraits and the occasional full-screen image. Yes, other games, notably RPGs, do this too, but Tears to Tiara II earns the "visual novel" distinction because it is much more in-depth with the story and dialogue. There is a lot of it. It wasn't too much for me, but there are large chunks where there is nothing but story. The first 90 minutes of the game had one short fight in it. While it could be a bit much, it didn't seem out of place. The dialogue and situations flowed pretty naturally, so it wasn't just lots of dialogue or story for the sake of padding the playtime. So if you are someone who skips through dialogue to get to the fights, you might want to steer clear. The battles are fairly standard SRPG faire, with the field divided up into a grid. You get better damage and accuracy from the backs and sides of opponents, different weapons have different ranges, strengths and weaknesses... you know how it goes. Tears to Tiara II adds a few things into the mix, the first being Awakening. There are certain characters that can transform into a stronger form for a few turns, once a meter is filled. When it wears off, their stats drop dramatically and they can only move 1 space for their next turn, so be careful when and where you use it. It's pretty cool, but isn't super new. The second thing is the Quadriga. One of your units is an elephant, who can move and attack, and also carries around the Quadriga behind them. This cart can reclaim units and put out another. It's similar to the base panel in the Disgaea games, but mobile and can be attacked and destroyed. The third is the Chain Stock. There are bubbles at the bottom of the character window that can be used to attack extra times, or boost magic attacks for more greater effect. Extra attacks are always nice when making sure to finish off your opponent. You do have to hit a button with correct timing to do them, so it's entirely possible to mess up. The fourth, and most unique addition is the rewind function. You can turn back any turns you have done, up to a maximum of 20, if you need or want to do something over. This is very useful. Sometimes you make the wrong choice of where to move, or who to attack (or even waste your chain attack on a chest...which I've sadly done more than once). Now, you can rewind and make a better choice. There's no limit to the amount of times you can do this in a battle. If you lose a battle, you can use this function to go back a few turns and try to fix any mistakes. However, as they state, doing the exact same thing (like attacking the same enemy from the same angle) will still produce the same result. So if you missed an attack, you won't hit it by trying it again from the same angle. Attack from the side or the back, and it has another chance to hit. It makes the game a lot more forgiving and a little easier to play. It's still far from an auto-win, so it won't make the game too easy. At first, you have to take battles as they come along, but eventually you will be able to re-do some battles for extra money and experience. Granted, it takes about 7 hours (!) to get to that point, but thankfully you can do some grinding if you want to. Most fights also include bonus objectives that give extra rewards at completion. These are nice, and it's hard to resist trying for all of them, but they don't note which rewards are from the bonuses, so I don't know if they are worth getting. The game is touted as being an 80 hour game, but it's closer to 50 or so for a first run through the game. After beating the story, there is an optional dungeon and even a new game plus. Many of the trophies will be obtained just by making your way through the game. Each battle has a trophy, and there are ones for beating the game on each difficulty. Thankfully the new game plus helps with that. If that's not enough, you can buy some extra characters to use in battle. These are crossover characters from another game, so they aren't selling you things that should have been included. It would have been nicer if the PSN pages for the characters actually showed them, or said what their weapon is, to make it easier to cherry-pick which characters I might want. While it's not going to be for everyone, I like Tears to Tiara II: Heir of the Overlord. It has a good mix of visual novel and strategy RPGs, which gives a lot of story and character development with fun grid-based battles. There is a lot of story and dialogue, so if you want people to shut up and get to the fights, you should probably stay away. The rewind function is unique, useful, and makes the game more forgiving. You might not take the proposed 80 hours to beat the game, but you should get your money's worth and fans of SRPGs should give Tears to Tiara II a try. Arcana Heart 3: LOVEMAX!!!!! is an all-girl anime fighter. Most of the graphics are really good in the game. The menu, character select, and character art all look great. The animations of the in-battle characters are good, but the sprites themselves look a little blocky and blurry. It's not enough to deter my enjoyment, but they do stand out against everything else looking crisp. The audio is in Japanese only, and a fair amount of the story lines are voiced. The game is basically a five-button fighter, although one of those isn't an attack, but a dash/tracking move. That said, it is really made for an arcade stick, since many commands require multiple buttons pressed simultaneously. It is playable on the PS3's default controller, as I was able to beat the game without an issue. When using an arcade stick, the multi-button presses became easier. So thankfully it controls pretty well on both the Dualshock 3 and an arcade stick. As stated before, there are five buttons for fighting, and the rest are set to different combinations of them. Each character has a weak, medium and strong attack that can be comboed together. There is also a homing attack, but it just dashes or floats you toward your opponent. You can attack from it, but it's not really an attack on its own. The arcana button will allow you to air launch and wall bounce your opponent, plus helps unleash the special move of your chosen arcana. The attacks and special attacks flow pretty well from each other, making combat fluid. The biggest gripes I have are the slow walking movement (necessitating the homing attack to move quickly) and that the homing attack always goes toward the opponent. It would be nice if it could be used to dash away from them, but I suppose then it wouldn't be "homing". There are a lot of special attacks to play around with though, and each arcana has a different trick, so being able to pick which one you want is nice. Thankfully, there is a good amount of single player content. There is a story mode, that while not super deep, allows you to pick who your next opponent is from a few choices. Add in some special dialogue when certain characters battle, and you get some decent replay as you make your way through with the different fighters. While there is a fair amount of dialogue, it feels more like other fighting games' arcade mode. The story for the After Story mode is much better. There is an overall narrative, with each girl's story intersecting with the others, so playing through them all gives one big story. Unfortunately, each story only contains one fight of one round, with lots of dialogue around it. More fights would have been better, but I like the way After Story was presented and how the stories would weave between each other. There is still some more single player stuff to the game, though. There are Trials, which pits you against another fighter, but also gives you a task to complete, like landing a ground combo or doing jump cancels. It's harder than other games' similar modes, simply because you have to do it while fighting, not in some pre-set scenario. No fighting game would be complete without a survival mode, and Arcana Heart delivers it combined with a score attack. To round it out there is also a time attack mode. While the last two are hardly revolutionary, they all add together to give a healthy amount of single player content to go through if you don't want to fight your friends or people online. All that single player content aside, a lot of the allure of fighting games is playing against others, especially online. I played a few matches, and didn't have much trouble finding games. Non-peak times were much leaner, which is to be expected of a niche fighting game. The matches I played had barely any lag that I could tell, and it felt pretty smooth once the fight started. I still got completely destroyed, since I'm not very competitive (or good at fighting games), but it wasn't lag that got me killed. Of course there's also a local versus mode if you don't wont to go online and have people to play with. Lots of things are unlockable in the game. The most obvious are the nice CG images shown throughout the various stories and endings. There's also the different animations that can be displayed on the side during the fights (since the battles are not in widescreen). It's better to view them here since they can be quite distracting during combat. You also unlock "Memories" for the characters, which are separate text-based stories told in several parts. They aren't necessary to the overall package, but they are kind of fun to read through once. Trophies run the usual fighting game gamut, from winning x amount of battles online, completing the trials and going through the story modes. There are many character specific ones which require you to utilize their unique talents and mechanics. The list is mostly skill based ones, with a few grind-heavy trophies thrown in for good measure. While not the best fighting game I've played, Arcana Heart 3 LOVEMAX!!!!! is pretty fun. If you dedicate enough time to it, there is a deep combat system at its heart (pun not intended). I'm not very good at fighting games, but there was enough single player content to keep me playing for awhile. The few matches I played online ran well, so I have no complaints there. Even if you aren't a competitive person like me, there is still some fun to be had going through the story modes and unlocking different extras. If you like the more methodical fighting games like Guilty Gear and BlazBlue, give Arcana Heart 3 LOVEMAX!!!!! and all its exclamation points a try.